In this part of the series, “Everything You Wanted To Know about Storage But Were Too Proud To Ask,” we’re going to be focusing on the network aspect of storage systems. As with any technical field, it’s too easy to dive into the jargon of the pieces and expect people to know exactly what you mean. Unfortunately, some of the terms may have alternative meanings in other areas of technology. 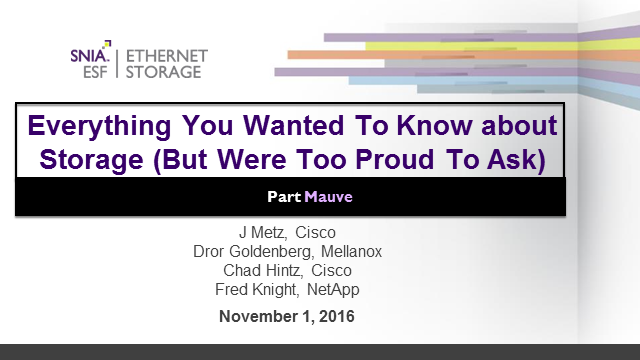 In this Webcast, we look at some of those terms specifically and discuss them as they relate to storage networking systems. For people who are familiar with Data Center Technology, whether it be Compute, Programming, or even Storage itself, some of these concepts may seem intuitive and obvious… until you start talking to people who are really into this stuff. This series of Webcasts will help be your Secret Decoder Ring to unlock the mysteries of what is going on when you hear these conversations.